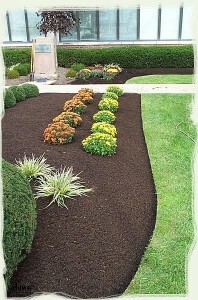 Mulching is primarily done in the spring and fall seasons. We offer a variety of mulch colors and ideas to choose from. Wood chipsare a byproduct of the pruning of trees by Arabist’s, utilities and parks; they are used to dispose of bulky waste. Tree branches and large stems are rather coarse after chipping and tend to be used as a mulch at least three inches thick. The chips are used to conserve soil moisture, moderate soil temperature and suppress weed growth. The decay of freshly produced chips from recently living woody plants, consumes nitrate; this is often off set with a light application of a high-nitrate fertilizer. 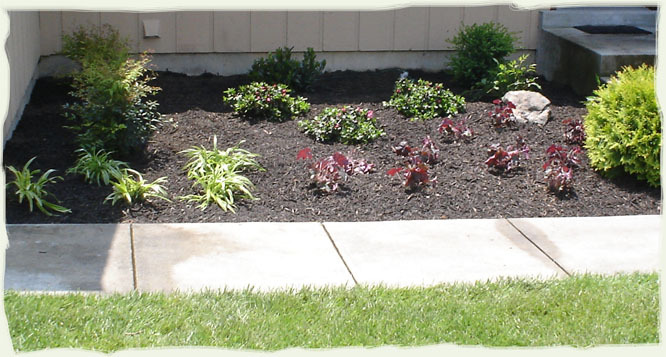 Wood chips are most often used under trees and shrubs. When used around soft stemmed plants, an un mulched zone is left around the plant stems to prevent stem rot or other possible diseases. They are often used to mulch trails, because they are readily produced with little additional cost outside of the normal disposal cost of tree maintenance.